Every home ferment must have a cover of some kind. Primarily, the job of the cloth cover is obvious: to prevent contamination. If left open to the air, problems such as mold and fruit flies would happen nearly every batch, as these tiny living things feed on the sugars present in young ferments. And so the simple answer is to always use a hard lid to cover your ferments. And we can end here. Hope that was helpful. Hey…you didn’t leave? Okay, you’re right, it’s not that easy. 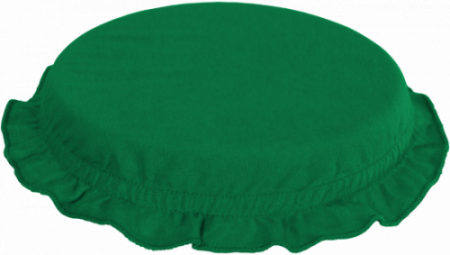 In fact, Kombucha (almost) always requires a breathable cloth cover rather than a hard lid. But every once in awhile, a hard lid on your Kombucha might be okay, or even necessary? And yet, perhaps you’ve seen other ferments that use a hard lid or a water seal. And is an airlock a hard lid or a breathable cover? So yes, it is a bit more complex. But the good news is the rules are easy to understand once you learn them. And even if you make a temporary mistake, switching to the correct type of cover will generally fix any issues. So whether the ferment is “aerobic” (likes airflow) or “anaerobic” (lid or airlock please! 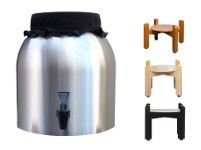 ), read below to learn how to pick the appropriate cover for your brew. The most commonly passed around piece of bad information is to use cheesecloth to cover a brew. This is never a good idea! 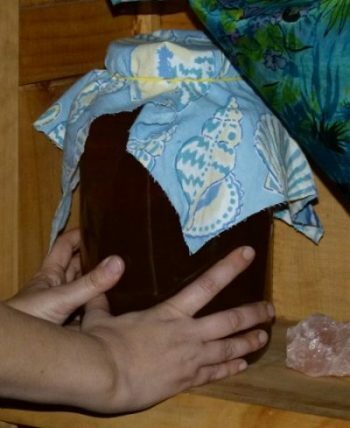 Even if you fold the cheesecloth over many times, it will still allow both fruit flies and other contaminants into the brew, especially over time. Fruit flies are pesky and persistent, they will find a way to wiggle in! If you have an issue, check this page for more info setting up traps to prevent a fruit fly infestation. 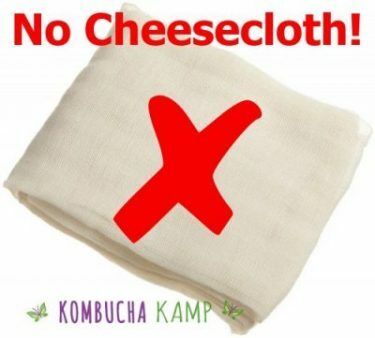 It may be tempting to use cheesecloth because so many websites mistakenly recommend it. Instead, when a recipe calls for covering the brew with cheesecloth, use any of the breathable cloth cover recommendations at the bottom of this article. Save the cheesecloth for making kefir cheese and whey! As the name implies, aerobic ferments are those that require oxygen, usually at the beginning of the fermentation process, in order to flourish. 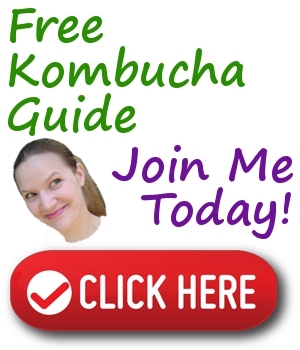 Like vinegar, both Kombucha and JUN are acetic acid dominant ferments. As such, they are best brewed in open top containers with a breathable cloth covering. To learn more about the yeast aerobic fermentation process, click here to visit our post on carbonation. As the brew progresses, a new layer of culture forms on top of the brew. That new layer begins to limit airflow to the liquid below, gradually transforming the aerobic ferment to an anaerobic one. 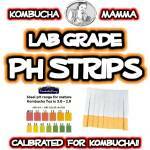 This is the natural progression that produces the unique sweet and sour flavor profiles of Kombucha and JUN. 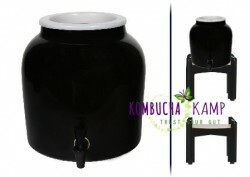 In order to allow for the air to flow, a breathable cloth cover is required for Kombucha and JUN. *Note: “Oh no, I used a hard lid for Kombucha! Now what?” While not ideal, using a hard lid for just a few days is not usually enough to ruin a batch or culture. 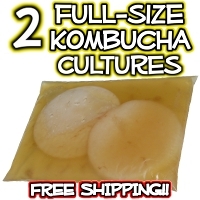 Kombucha is strong! But eventually the yeast will start to create a bad smell in the jar, and it may lead to off flavors or even mold. No worries, if you catch the mistake in time, and as long as there is no mold, you may be able to save a stinky brew by simply switching to a cloth cover and adding a little sweet tea to re-set the process. If the flavor and smell come back to normal, all is well! *Note 2: As with any good rule, there are a couple of exceptions when using a Hard Lid with Kombucha or JUN is acceptable. If moving the brew or Hotel to a new home, it is fine to put a lid on it for a few hours or even days while in transit. However, try to do so towards the end of a brewing cycle or while on a brewing break. Covering a young brew with a hard lid will lead to bad smells faster. But if all the liquid is mature, the lid can remain on longer without issues. Also keep in mind that Kombucha is less viscous than water so keep the vessel upright and pack towels around it to catch any leaks.. If you have a fully mature SCOBY Hotel with well fermented liquid (no sweet tea added recently), it may be possible to store with a lid for a few weeks without issue. This can help with reducing evaporation if taking an extended break from brewing. However, we do not recommend leaving Hotels like this indefinitely, as eventually they suffer from the same stale and stinky yeast issues as brews with a hard lid. Learn more about SCOBY Hotel maintenance at the post here. 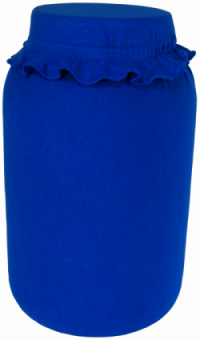 For more about the best types of breathable cloth covers, read below. For the best tasting kefir for drinking, we find a breathable cloth cover to be the superior choice. However, there are situations where other options can be better. 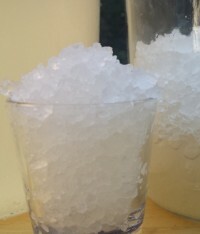 Because they have a shorter fermentation cycle, both milk kefir and water kefir grains must be fed more often. One way to slow the fermentation down is to add a hard lid to the vessel, whether brewing or just storing the grains. 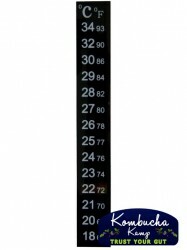 This restricts the airflow, which slows the fermentation a bit, therefore requiring less feeding. A hard lid can yield more bubbles, but also lead to a more yeasty taste, or a brew that is weaker with less depth of flavor. Another claimed advantage of a hard lid is preventing cross-contamination with other brews in the area. While it is possible for yeast to transfer from the air to the brew, we often store different brews close together on the kitchen counter without any crossover. As long as there is no mold it’s not a safety issue. Some people swear by the use of an airlock when making kefir, but our experiments have never yielded much difference from a hard lid. That said, if your kefir brew is particularly active with bubbles, and you plan to leave it alone for many days at a time, carbonation could build up and lead to a broken vessel. While we’ve never had that problem, people brewing in warmer environments may want to keep an eye out for any pressure building up. In those cases, an airlock can be an excellent option as it will allow the excess carbon dioxide to dissipate naturally. Then again, a breathable cloth cover is also a great choice, and requires no special equipment. KMamma Sez: Closed top vs open top fermentation? In recent years, as fermentation has become popular again, this question has sparked quite a bit of debate. Sandor Katz points out that humans have been fermenting in a variety of open and sealed vessels for millennia. More important than whether the ferment is exposed to oxygen or not, is how the ideal conditions for fermentation are maintained. For example, milk kefir was traditionally stored in skin bags that hung near doorways. While the bags were closed, they weren’t airtight. Even for fermented veggies, whether using a water sealed crock or an airlock, neither of these creates a truly “anaerobic” environment as oxygen is present in the head space and the liquid. The key to successfully fermenting vegetables is that they are fully submerged in the brine. Another point to consider, fermentation often creates carbon dioxide as a by product (the bubbles are how our ancestors knew fermentation was happening!) and if a jar is airtight, not monitored and not in a vessel that can withstand that pressure, it could potentially explode. To ensure safety, monitor ferments frequently, learn their behavior under different conditions and enjoy the process! 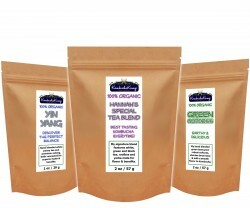 While technically fermented veggies can be aerobic or anaerobic, the best results are achieved with a solid sealing lid. Ever popular canning jars, with or without airlocks, make a great option for these ferments. The key to crispy fermented veggies is that they must be submerged below the brine. The high salt concentration prevents oxygen from penetrating the liquid so the lactobacillus can create lactic acid. While a tight lid will help to minimize exposure to oxygen loving molds, it may not prevent them from growing on the surface. 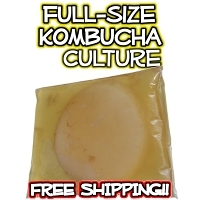 *Note: Although mold is an immediate cause for throwing away ALL of our culture ferments such as Kombucha, JUN and Kefir, fermented veggies are an exception and may be salvageable. Traditionally, any mold found forming on a top layer is skimmed off to reveal delicious, well preserved kraut or veggies below. However, with so many people experiencing compromised immune systems these days, that may not be wise. Honestly, we often toss the jar if mold is present, but others report no issues with removing it and eating the mold free layers below. Trust YOUR gut! 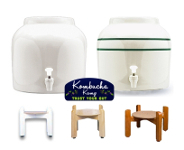 As with all Kombucha Brewing Supplies, there are a variety of options, and each delivers a different quality of experience. We prefer sustainable covers that can be re-used. And we admit that we prefer the cloth cover to look cute. We love our booch and want to make it look nice! But of course the most important factor is security: keeping those pesky fruit flies and any mold spores or other contaminants out of the brew. While some people use coffee filters or paper towels with a rubber band, these options need to be replaced each batch. Seams in between sheets of paper towels can stretch open, leaving the brew exposed. Even a drop of liquid can lead to a hole. Tears form easily when adding to or removing from the vessel. The rubber band can expand while on the brew, leading to tears in paper covers. So while they can work temporarily, we highly recommend switching from disposable covers to a more sustainable long term option. When choosing what to make a cloth cover out of, the material is the key question. The absolute best option is 100% cotton, soft, thin, with a tight weave. Avoid polyester or blends, and never use a loose weave fabric. Also, avoid kitchen towels which are generally a bit thick. Instead, an old cotton t-shirt or bed sheets are often the ideal option. For maximum security and style, we invented these exclusive Caps in 2 sizes and a variety of colors. Not only are they the best looking option, the gripper elastic grabs tightly to any vessel opening shape to prevent fruit flies from slipping into a crack and invading the brew. These caps work well even with the slick and angled sides of many Continuous Brew vessels. In fact, these caps were invented specifically because a regular cloth cover and rubber band will often slip off the slick glazed opening of the Modern Porcelain CB. The gripper elastic grabs onto the rim and keeps all those pesky buggers out of your brew! BONUS – What about a cover for the rest of my vessel? You may notice that some Kombucha brands at the store are available in brown bottles. Why? *Note: For most homebrewers, our bottles are not exposed to much light as they are stored in a cupboard or fridge (where the light is off until the door opens). So darker bottles aren’t really needed for homemade ferments in most cases. But what about brewing in clear glass, will light cause issues? It is true that indirect light is not a problem. But if you have a brewing location that is exposed to direct sunlight, or if you’d like to take advantage of the sun’s warmth to keep the brew at the right temperature, using a Jar T-Shirt or Brewer T-Shirt could be an excellent option to keep your microbes safe and happy. 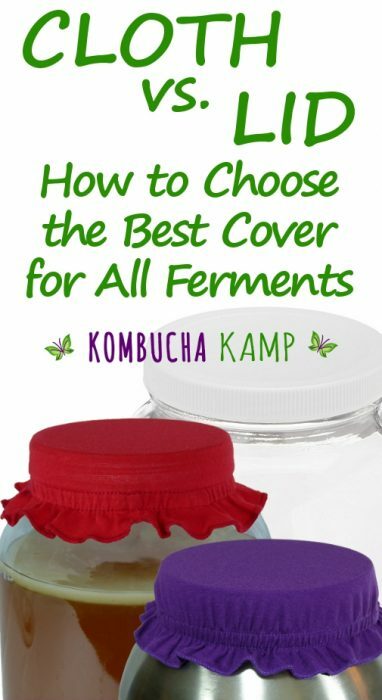 Check out all our Fermentation Covers here. While you might consider an airlock for a kefir brew, they are most useful for fermented veggies, especially if the jars will be left alone for a significant period of time. Too much carbonation can build up and lead to distorted tops or outright blow-outs, which are messy and could be dangerous. Airlocks come in a few forms. Traditionally they are a small device that you can attach to a jar lid. The tubing in the airlock creates a reservoir for liquid that allows for carbon dioxide pass out of the jar without allowing contamination in (and reducing oxygen exposure), which releases the pressure to prevent explosions. 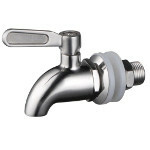 These days, there are waterless airlock options which may be a good choice depending on your vessel. Or in many cases, a simple hard lid is a fine choice.